Sweet Lemon Pickle (Limbu Nu Athanu) is a mouthwatering and anyone can lure it for Sweet Lemon Pickle. Sweet Lemon Pickle tastes like sweet, spicy and sour. Sweet Lemon Pickle is a condiment that is very common in South Asian countries. Sweet Lemon Pickle is my very own state Gujarat, India. There is so many different methods to make it, some are instant and some are traditional summer sundried. This pickle is slightly different but mixed version of both. You don’t need any season to make this pickle. It’s absolutely easy and delicious. 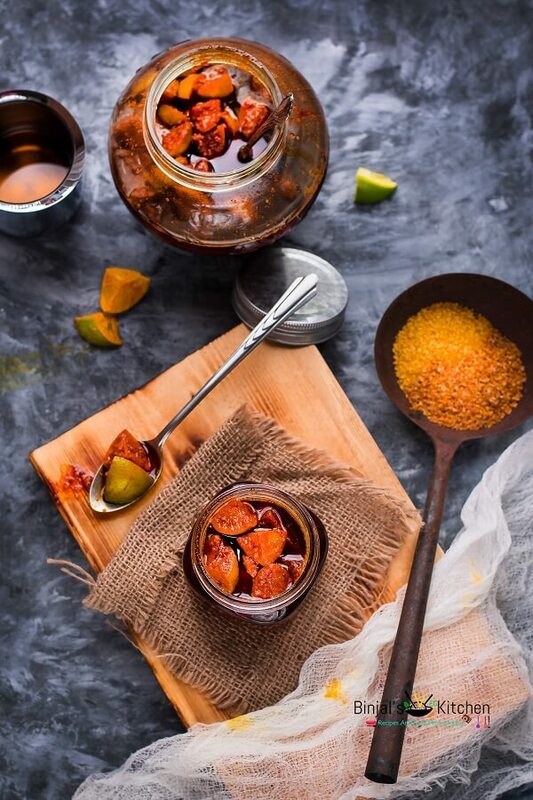 I learnt this pickle from my granny, when I have been in India my granny used to send me different kind of pickles in all seasons and Sweet Lemon Pickle is one of my favorite. But here in the USA, all you guys know we cannot carry any pickle while traveling in a flight so I could not bring it with me. However, I bought it from an Indian grocery store but it was not like my granny so one day I was missing the taste of my granny’s made Sweet Lemon Pickle and literally craving for it, then what I just called her immediately and wrote down each and every step and finally made my favorite Limbu Nu Athanu so here is my tried and tasted full proof Sweet Lemon Pickle. 1. Wash and wipe the lime, allow to dry, then cut each lemon into 8 equal pieces. 2. Take a bowl add chopped lemon, 1-2 tsp salt and turmeric, mix it very well, cover it and keep aside in dry a place for 24 hours. 3. Next day boil 2-3 cup of water into the wide pan. Add soaked lemon in it and bring it to the boil. 4. Strain the water mixture using sieve and remove all water, spread all lemon on kitchen towel and dry it. 5. Now heat oil in a pan. Add hing, mustard seeds, fenugreek seeds and fennel in the pan, stir it for 2-3 second on low flame, then add red chili powder, coriander powder and cumin powder, stir it again for few seconds, now add grated jaggery, continue stirring it till melted on low flame. 6. Take lemon pieces add into the jaggery-masala mixture and add salt as per taste, switch of the flame, mix it properly, allow it to cool down completely, then add into the glass jar and keep aside. 7. Now last step is to keep lemon pickle long lasting, heat the mustard oil in to the small sauce pan, let it cool down, then pour over the prepared lemon pickle, mix it slowly using spoon, cover the lid and place it into the dry place (kitchen shelves). 8. Sweet Lemon Pickle or Limbu Nu Athanu is ready to use, serve it with meal as a side or serve it with Mathari or a dry snacks item and enjoy the pickle. • You can store this pickle in a jar up to 2 months in kitchen shelve. • You can make this pickle in any season in any weather. • You can add chopped green chilies into this pickle for sour and spicy pickle. • You can use brown sugar instead of jaggery. Wash and wipe the lime, allow to dry, then cut each lemon into 8 equal pieces. Take a bowl add chopped lemon, 1-2 tsp salt and turmeric, mix it very well, cover it and keep aside in dry a place for 24 hours. Next day boil 2-3 cup of water into the wide pan. Add soaked lemon in it and bring it to the boil. Strain the water mixture using sieve and remove all water, spread all lemon on kitchen towel and dry it. Now heat oil in a pan. Add hing, mustard seeds, fenugreek seeds and fennel in the pan, stir it for 2-3 second on low flame, then add red chili powder, coriander powder and cumin powder, stir it again for few seconds, now add grated jaggery, continue stirring it till melted on low flame. Take lemon pieces add into the jaggery-masala mixture and add salt as per taste, switch of the flame, mix it properly, allow it to cool down completely, then add into the glass jar and keep aside. Now last step is to keep lemon pickle long lasting, heat the mustard oil in to the small sauce pan, let it cool down, then pour over the prepared lemon pickle, mix it slowly using spoon, cover the lid and place it into the dry place (kitchen shelves). Sweet Lemon Pickle or Limbu Nu Athanu is ready to use, serve it with meal as a side or serve it with Mathari or a dry snacks item and enjoy the pickle. Brilliant Photography Binjal…I always get stuck looking at the pictures…The pickle is a must try one. I am so trying it Binjal! Loved the simple recipe.